Most photos you see of the Reflecting Pool are looking west towards the Lincoln Memorial or east towards the World War II Memorial, Washington Monument, and US Capitol Building. This one, which I took on a cold, misty winter’s day, is looking across, from south to north, towards Constitution Gardens. The Lincoln Memorial Reflecting Pool is a long, thin, shallow body of water running from the Lincoln Memorial at one end to the National World War II Memorial at the other. 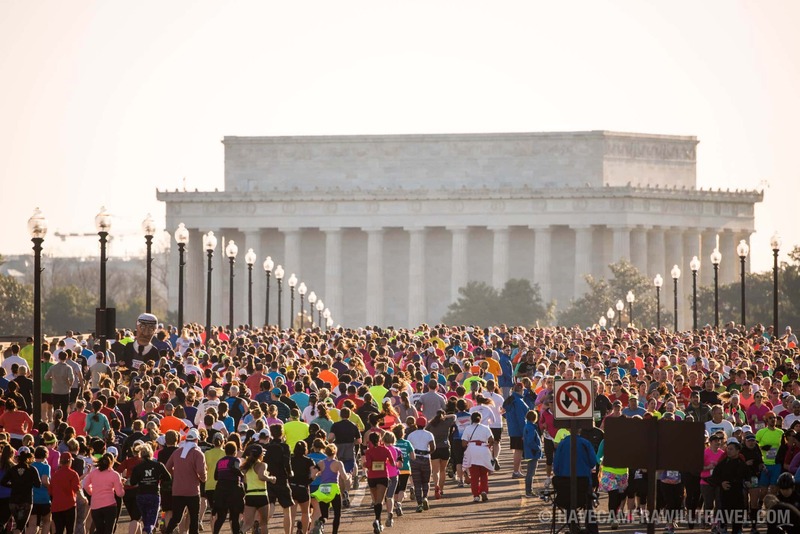 It has been the scene of some of Washington's most memorable events of the last century or so, perhaps most famously Dr. Martin Luther King's "I Have a Dream" speech as part of the 1963 March on Washington, a pivotal moment in the American civil rights movement. Because it's so shallow, it gets calm quickly, providing a mirror-like, smooth surface. It is particularly effective at night, when the smooth surface of the water provides a sharp reflection for the lights on the monuments at either end. This was taken before sunrise around the time of the spring equinox. 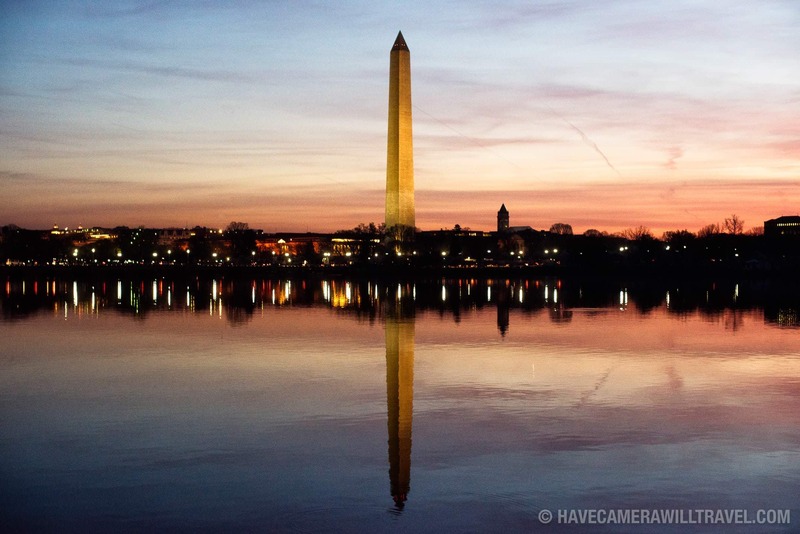 You can see the glow of the sun below the horizon directly behind the Washington Monument, which is directly east. The renovations of the Reflecting Pool fixed a number of things with the water flow and drainage. They also made it shallower. On this hot spring day people were out doing the Forrest Gump thing. During very cold winter stretches you can also find ice skaters out on it (not officially sanctioned). Sunrise a few days before the spring equinox. At the time this was taken, scaffolding covered the dome of the US Capitol Building in the distance. This view is from the top of the Washington Monument. Under normal circumstances, you can tour the Washington Monument and ride an escalator to the top for views out over DC. But the combination of renovations and unreliable elevator mean that that option isn't always open. The area around is a favorite for soldiers from the local military bases to do their early morning exercise. 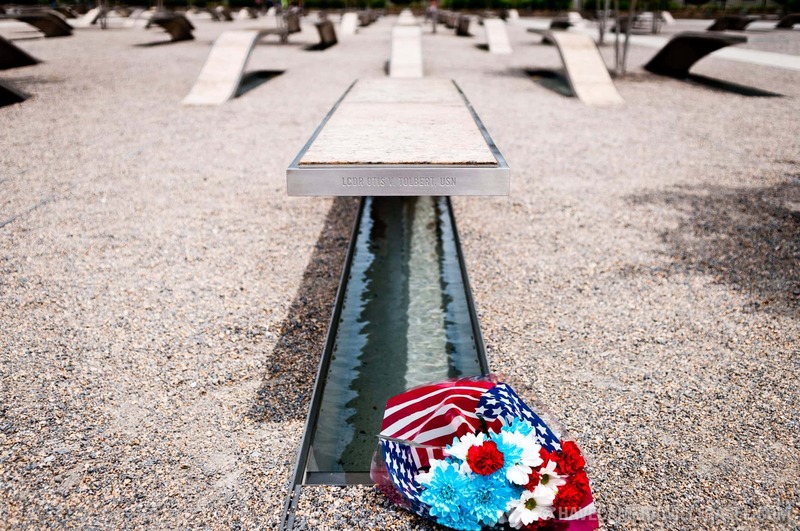 In this shot, two soldiers are doing laps around the Reflecting Pool while wearing their packs to build up their endurance. With the water temperature colder than the air temperature on this morning at sunrise, a mist rises from the water. This shot, taken with a moderate telephoto lens, is from the eastern end of the Reflecting Pool, next to the World War II Memorial. The best way to get to the Reflecting Pool is by Metro. The closest stops are Foggy Bottom (0.8 miles) (Orange and Blue lines), Smithsonian (1.1. miles) (Orange line), Arlington National Cemetery (0.9 miles) (Blue line), or Federal Triangle (1.4 miles) (Orange line). Metro has a handy Trip Planner and here's a map of the Metro lines. There isn't any parking immediately next to the Reflecting Pool, but depending on time of day and how busy it is, it might be possible to find parking along Constitution Avenue. But make careful note of the signs to make sure you don't get towed. There's often parking on the southern side of the Reflecting Pool on the waterfront of West Potomac Park all the way out along Hains Point. The Reflecting Pool is accessible at any time of the day or night. There are no restrictions on using a flash so long as you're not using them with stands. If you want to take best advantage of the reflections at night, a tripod or some other kind of solid support is a must. You can't use a tripod on the main steps of the Lincoln Memorial, but there are plenty of places below that and at the other end where you can use one. Occasionally you might come across NPS rangers telling you that you can't use tripods, but I've confirmed directly with NPS headquarters that they are in fact allowed if you're shooting for personal use (with the common-sense caveat that you're not creating a tripping hazard). There's plenty of room at either end to set up a tripod at water level out of the path of pedestrian traffic. Commercial shoots and filming may require a permit. 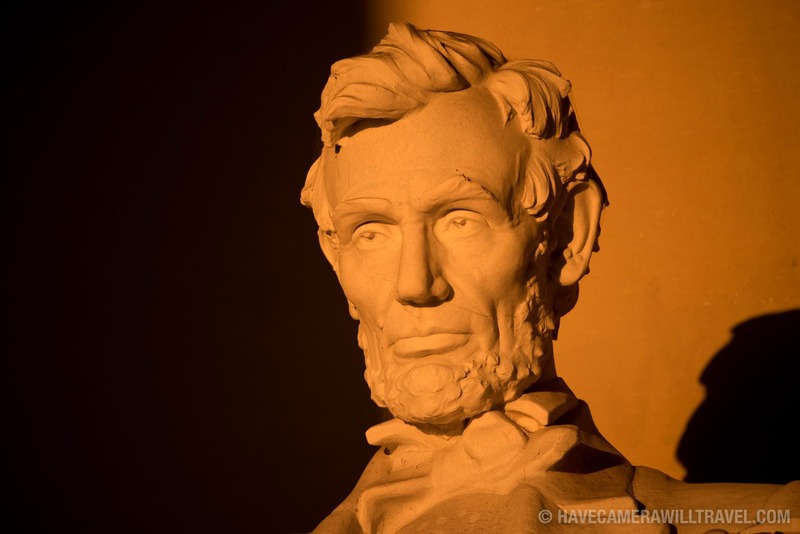 You can find more of my photos of the Lincoln Memorial Reflecting Pool here.